One of my favorite side dishes my mom makes is carote all’insalata or carrot salad. 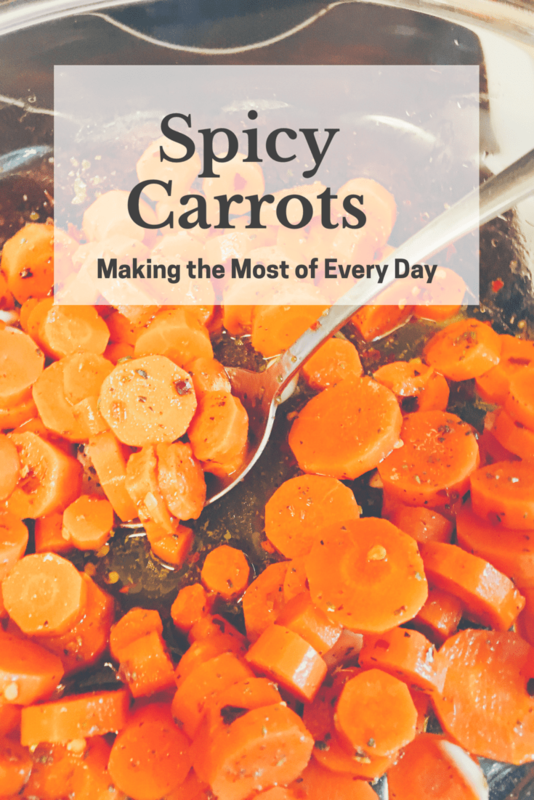 Since they are cooked and not salad-like at all, I’ll call them spicy carrots because that’s what they are. Whenever my mom goes to a pot luck at my in-laws’ they want her to bring this dish. It is much loved around here! The longer they sit, the more flavorful they get so this is a great make-ahead dish. It’s also okay if they are served cold or at room temperature. So it’s just a good dish all around! It’s really more procedure than it is recipe but I’ll give you measurements and you can adjust to quantities and taste. Slice the carrots into “coins” and place in a heat-proof bowl. Steam them. I like to put about one tablespoon of water in the bowl and cover it. Cook on high (100%) for 4-6 minutes but you may use a steamer basket or your rice cooker. Basically steam them however you usually steam veggies. You want them to be crisp-tender, not mushy. Drain and transfer cooked carrots to a serving bowl. Add remaining ingredients: garlic to vinegar. Toss well. Let it sit for a few hours or overnight before serving. Stir occasionally so that all the flavors meld. Taste for salt and spiciness. Add more salt and red pepper if needed (we like ours SPICY!) Sometimes the carrots will absorb the liquid so you may need to add a bit more oil and/or vinegar. It’s such an easy dish to make but it’s so tasty! Give it a try! You can pin the below image so that you can find this recipe again! Thanks for stopping by my Italian kitchen!